It's black raspberry season, my favorite harvest of the year. A few years ago when we were visiting a friend in Ohio, she served the smoothest, most flavorful pie made from black raspberries. It was love at first bite. On that same trip I also found a delicious black raspberry jam, silky and seedless, a rarity in that type of jam. I started growing our own soon after that, but was never able to find good instructions on how to make a jam like the one I remember from a few years ago. Most of the recipes I found were either jellies, or they had instructions but no actual measurements. I read about a dozen recipes and created this one. 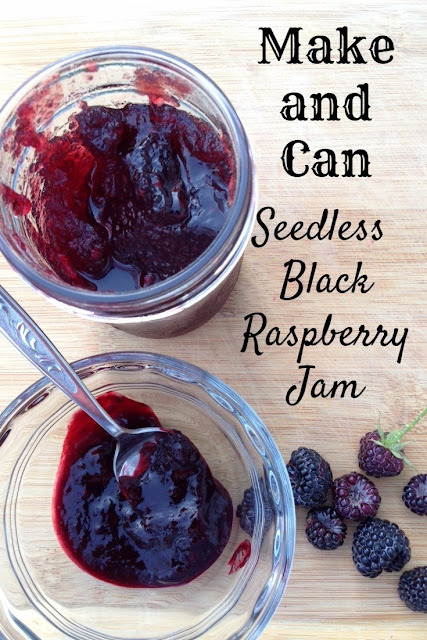 If you have access to these delicious berries, this is a great way to stretch and preserve them so you can still enjoy them after the season is over. 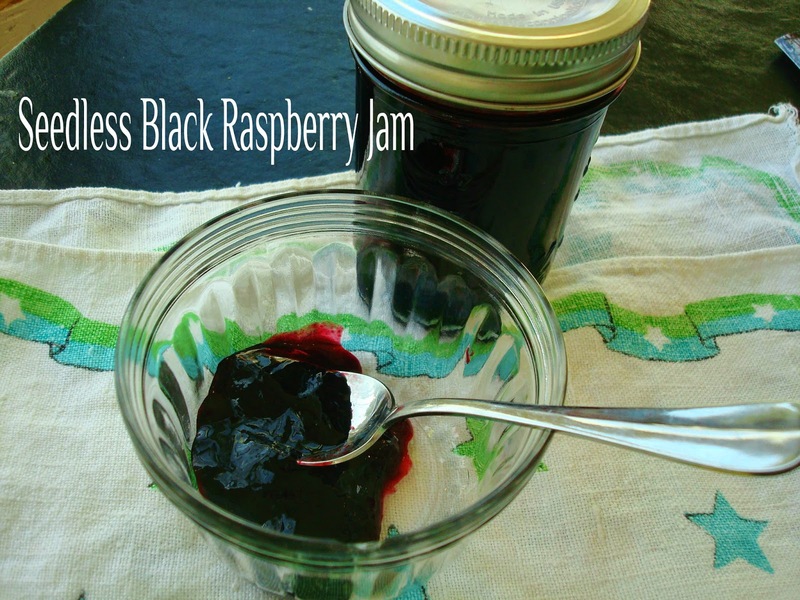 This jam is equally delicious on breads or stirred into plain yogurt. It makes my morning! There is one thing you can do to make this an even easier project: Cook the berries the night before, strain out the seeds by pressing the berries into a mesh strainer over a bowl with the back of a spoon, and let it the strainer continue to drip into the bowl overnight. The next day, you'll have your juice for jam making and can either freeze it for another day, or go ahead and cook your jam. 2 quart glass bowl, metal strainer, wooden spoon. Combine berry juice, lemon juice, and sugar in a stockpot. Add 1/2 tsp. butter to reduce foaming. Bring mixture to a full rolling boil over high heat that cannot be stirred down, while stirring frequently. Add pectin. Continue hard boil for one minute, stirring constantly. Remove from heat. Skim foam if needed. Ladle into hot half pint jars leaving 1/4 inch headspace. Process in water bath canner for ten minutes.